Many traders observe that if you consult the price action in three different timeframes and trade only when all three agree, you will reduce the number of losing trades. You will also reduce the number of total trades, and that is probably why the multi-timeframe discipline is not as widely followed as it could be. The exact combination of timeframes does not matter — you can use one hour (H1) and 6 hours (H6), or two hours (H2) and one day (D1), or one day (D1) + one week (W1) + one month (MN), or whatever suits your fancy. The key point is confirmation. Because we have pullbacks and false breakouts in Forex, consulting multiple timeframes improves the chances of identifying any particular move correctly. The chart below is showing the GBP/USD on a 15-minute timeframe. The GBP is rallying strongly. Should you buy for more upmove? The stochastic in the middle window indicates the GBP is already overbought in this timeframe, although the MACD shows it has room to run to the upside. What this chart is telling you is that you are late to this move. 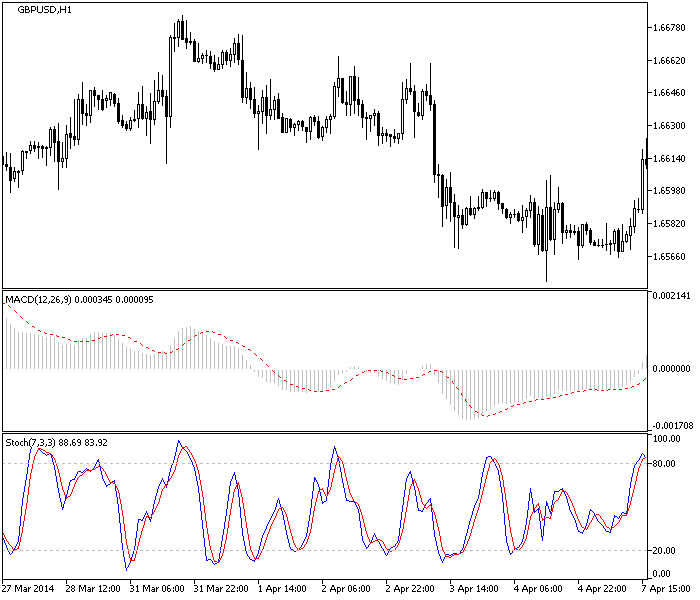 GBP/USD is overbought according to stochastic on M15 timeframe. Now look at the same information on the hourly chart. 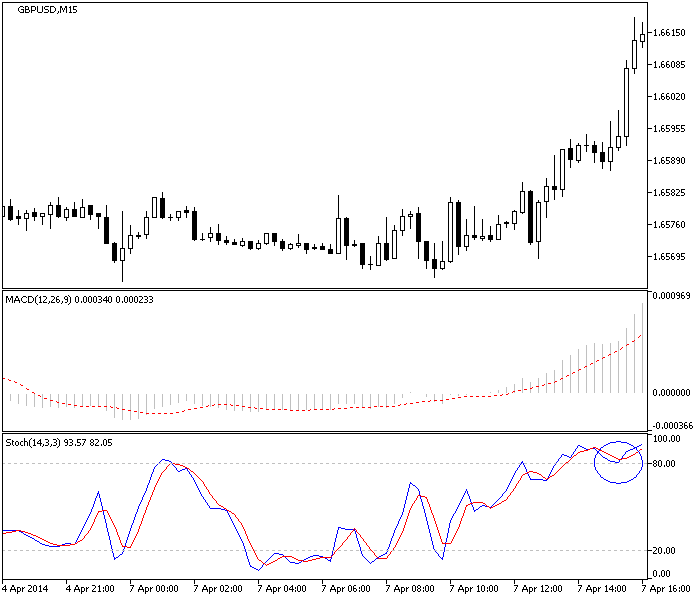 In this view, the pound is overbought in the stochastic and MACD has room on the upside. 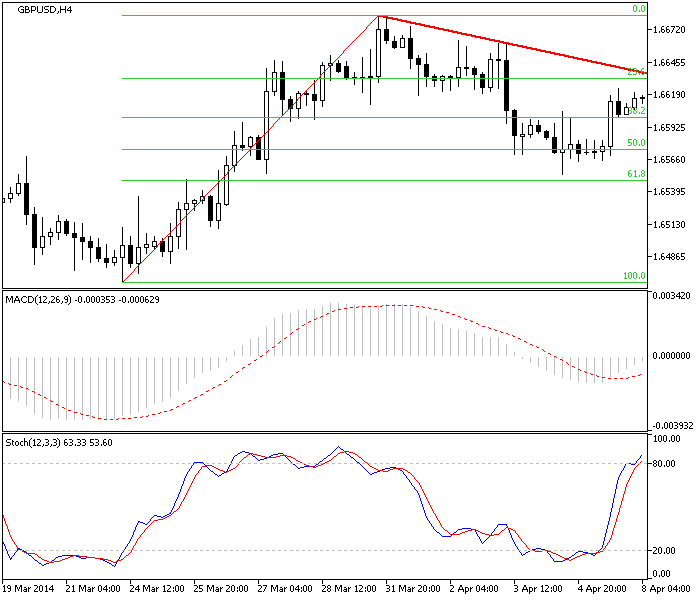 GBP/USD is also overbought according to stochastic on H1 timeframe. Finally, check out the indicators on the 240-minute (H4) chart. This one adds the Fibonacci sequence and shows that the pullback ended a little short of the 62% retracement level. Therefore the upward bounce is likely to be robust. How robust? At least to the hand-drawn red resistance line. Note that you do not have to believe in the theories behind the Fibonacci sequence to use the lines to gauge the extent of a pullback. H4 timeframe shows that there is still some room for GBP/USD to go up. Should We Buy the GBP? In this instance, we have agreement in one indicator (MACD) across all timeframes that buying the GBP here is a good trade. Ideally, you want another indicator to agree with the MACD, and we do not have that here. If we believe the stochastic, the move is already overbought and will end at any minute, so if we do the long GBP trade, we need to be ready to get out fast. But the hand-drawn red resistance gives us a profit target. Using multiple timeframes is a tried-and-true technique that reduces errors, even if it is an additional time-consuming step. It is not all that time-consuming though – you can learn to toggle among different timeframes very quickly on your charts. If you are using trend-following indicators, multiple timeframes are most helpful when prices are trending and less useful or downright misleading when prices are range-trading. 2. Multiple timeframes takes too much time. to spot the beginning or end of a move. Topic 01 - What Is Market Sentiment?